The industry, security or other business sectors linked with urgent interventions: firemen, security…are today in need of applications that manage and supervise the on-call duty personnel, to be able to react immediately. The MEMOGuard software identifies alerts from a manual panel, a land-line or cellular telephone, an alarm exchange or a computer network. Subsequently it begins pre-defined procedures controlled by a detailed calendar planning. And finally MEMOGuard contact the on-call duty personnel using all means of communication at its disposal: GSM cellular phone, pager or land-line telephone, independent of the frequency, protocol or operator used, email. This software solution allows supervision to be responsive to crises, alerts and alarms preventing the service personnel. The supervisory application also allows to be proactive in avoiding risks through its platform management and supervision of a fine. Complete software platform for on-call management , it identifies an alarm or alert, deals alerts according to procedures and pre-defined on-call schedules, and alerts the standby personnel on mobile phone (SMS, voice call ), pager, landline phone, mail, SMS to email or mail to SMS. CLEVER by multi-operator platform secured in the case where priority messages, secure or encrypted is required. True industrial controller, it can monitor and manage crises on an alarm signal. MEMO Guard® is a complete software for the management of on-call duty agents. MEMO Guard® identifies an alarm or an alert. 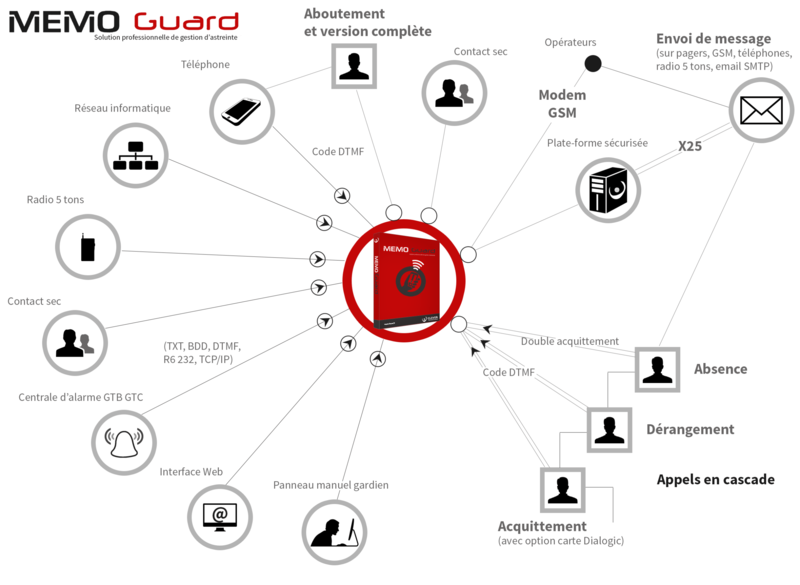 MEMO Guard® deals with the alarms according to predefined procedures and planning. MEMO Guard® informs the on-call duty personnel on the mobile phone, pager or land-line telephone. After the definition and configuration of the alarms and alerts messages, MEMO Guard® sets off a procedure according to the predefined planning. It can be a daily or a weekly planning, etc… with days and time slots determination of the on-call duty. The annual planning supervises the weekly planning. The administrator can also manage the days off, absences or illnesses of the on-call duty agents, until the last moment, thanks to the substitutions’ planning. The MEMO Guard® procedures specify the calls loops, priorities and redundancies. The calls can be differed if an agent is not reachable. Then, the alert messages are stored by MEMO Guard®. MEMO Guard® recalls automatically in cascade the on-call duty personnel, until the confirmation of the message reception (acknowledgement of the process). You can constantly define these cascades parameters (complete version). MEMO Guard® can send an alert message to an on-call duty group. The first agent to acknowledge makes it for the group, which stops the cascade process. MEMO Guard® enables the voice connection (direct connexion) between the on-call duty technician and the guardian or witness of the incident. This functionality is possible on MEMO Guard® only with the complete version which includes a 4 channel vocal communication card. The first one indicates that the incident has been taken care of. The second one announces the end of the intervention. If the double acknowledgement is not carried out in a defined time lapse, MEMO Guard® can sets off a new procedure. When an on-call duty agent calls back MEMO Guard®, this one consults his personalized voice mail, thanks to an access code. This involves a better management and a simplification of the calls and voice mail consultation. MEMO Guard® runs under a NT service. It is not necessary then to open a specific session with Windows® NT. Like all CLEVER Technologies’ software, MEMO Guard® is a multi-operator application. – Via GSM modem (delivered in the pack, see below) by sending directly on the operator network. – Via the multi-operators secure platform CLEVER, in the case where priority, secure and encrypted messages would be necessary. MEMO Guard® generates a detailed, time and date stamped sending log of all the events which have occurred, as well as an alarm log. A motor vehicle equipment manufacturer has a failure in his production line. The service engineer, absent at the time of the breakdown received the alert only 4 hours later. In addition to that, the time of repair has involved the discontinuation of one day manufacture. This production failure has generated in chain a failure with the principal customer of the company. Such cessation of production has cost several million of franc to the company and led to the loss of an important customer. From now on, MEMO Guard® informs about the slightest anomaly in the production line and warns within less than two minutes each technician on their GSM telephones and their pager. If one of them does not answer in a defined time lapse, MEMO Guard® calls automatically two other agents in cascade, then recalls the first one in the event of non-response until one of the technician calls back the answering machine to be identified and to announce that he is able to take care of the intervention. MEMO Guard® enables all the companies which manage a production line to avoid serious problems. MEMO Guard® guarantees a better reactivity from the on-call duty agents. A superstore trading group got a server breakdown which contained the stocks status to be delivered to the supermarkets. The breakdown lasted several hours before the IT manager notices it. The server merely « crashed » itself. All the orders of the day were deferred to the following day for the supermarkets. Many articles were missing in the departments and the opportunity cost was several million of franc for the trading group. From now on, MEMO Guard® warns the IT manager on his land-line or mobile phone when notices the slightest abnormal movement on a server. MEMO Guard® informs you about any breakdown or IT failure. The pack contains a dual-band 900/1800 MHz GSM modem for SMS sending via operator. The 2 channel vocal communication card enables to receive simultaneously two alarms. Version with 2 limited cascade calls and 2 parallel calls per procedure. The software only runs under Windows® NT 4.0 and above, and requires a Pentium® PC, as a dedicated station, with 128 Mo of Ram. Version with 2 limited cascade calls and 4 parallel calls per procedure. Version with an unlimited cascade number per procedure, a simultaneous call number limited to the number of card channels (4 on the BASIC Version) and a voice connection function. Version with an unlimited cascade number per procedure, a simultaneous call number limited to the card channel number (4 on the BASIC Version) and a voice connection function.